To add a new module to an AQtime project, select Add Module from the context menu of the Setup panel or from the Setup toolbar, or from the Project menu and then select the desired file using the subsequent Open File dialog. Drag the desired file(s) from Windows Explorer to the Modules pane. 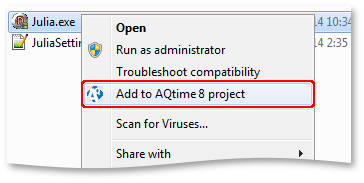 Right-click the desired file(s) in Windows Explorer and select Add to AQtime 8 project from the context menu. To add a .NET assembly registered in the Global Assembly Cache (GAC) to the AQtime project, select Add Assembly from the context menu of the Setup panel or from the Setup toolbar, or from the Project menu. This will call the Add Assembly dialog, where you can select the desired assemblies. To add the web page whose script you want to profile, select Add URL from the context menu of the Setup panel, from the Setup toolbar, or from the Project menu and enter the page address in the ensuing Add URL dialog. Once you have created a new project, you can add modules (EXE, DLL, OCX, etc.) to profile the project with. Once added, these modules are displayed in AQtime’s Setup panel. To add a new module to the project once it has already been created, select Add Module from the context menu of the Setup panel or from the Setup toolbar; or right-click the project in the Solution Explorer and select Add > Add Module from the context menu. To add a .NET assembly registered in the Global Assembly Cache (GAC) to the AQtime project, select Add Assembly from the context menu of the Setup panel or from the Setup toolbar; or right-click the project in the Solution Explorer and select Add > Add Assembly from the context menu. This will call the Add Assembly dialog, where you can select the desired assemblies. To add a web-page whose script you want to profile, select Add URL from the context menu of the Setup panel, from the Setup toolbar, or from the context menu of the Solution Explorer and enter the page address in the ensuing Add URL dialog. To add a new module to the project once it has already been created, select Add Module from the context menu of the Setup panel or click the Add Module button on the Setup toolbar; or right-click your AQtime project in the Project Manager and select Add Module from the context menu. To add a .NET assembly registered in the Global Assembly Cache (GAC) to the AQtime project, select Add Assembly from the context menu of the Setup panel or from the Setup toolbar; or right-click your AQtime project in the Project Manager and select Add Assembly from the context menu. This will call the Add Assembly dialog, where you can select the desired assemblies. To add a web-page whose script you want to profile, select Add URL from the context menu of the Setup panel, from the Setup toolbar, or from the context menu of the Project Manager and enter the page address in the ensuing Add URL dialog. Sometimes, AQtime profilers may need to use debug info files that are generated apart from the executables. In this case, you need to add the paths to these modules to the project by using the Symbols Options dialog. To learn how to do this, see Specifying Path to Debug Info Files. An AQtime project can only contain 32-bit (x86) or 64-bit (x64) modules, but not both. The project cannot contain modules with different “bitness”. This behavior is caused by a Windows limitation that 32-bit modules can be loaded into a 32-bit process only and 64-bit modules can be loaded into 64-process only (you cannot load a 32-bit module to a 64-bit process). So, if you add a 64-bit module to your AQtime project, you can continue adding 64-bit modules only. If you add a 32-bit module, you can only add 32-bit modules. To change the “bitness” of the project, clear the modules list and then add the desired modules. You can add as many modules, from as many folders, as you wish. The module that was added to the AQtime project first, will be the main module. This means that AQtime will launch this module when you start profiling. Other modules are not started by AQtime; they will be loaded by the main module. You can change the main module at any time by right-clicking the desired module and selecting Set as Active from the context menu. If the main module is a DLL or an OCX file, you have to specify a Host Application for your project so that AQtime can start profiling. The host application can be set in the Run Parameters dialog. For more information, see Specifying Parameters for the Profiled Application. To remove a module from a project, right-click the module in the Modules pane and select Remove from the context menu. You can also replace the module with a new one by right-clicking the module and selecting Replace.